With the DVD/Blu-Ray release of ‘Where The Wild Things Are’, which took direct influence from the 80’s era of creature fantasy films, Warner Bros has reissued Wolfgang Petersen’s semi-classic creature feature ‘The Neverending Story’ - an entirely German production, though shot in English, headed by Wolfgang Petersen, his first film since his breakthrough ‘Das Boot’. Though based on a German novel relatively unknown in North America, it’s still a familiar set-up in the realm of fantasy. A young boy Bastian, whose mother recently died, lives a sad life with his father, ill-equipped to raise a boy on his own. Add to that the constant harassment by a trio of childhood bullies, means the only thing left for Bastian to fall upon is his imagination and love for stories. After being chased away by the bullies Bastian finds himself in a book store where he meets a kindly old curmudgeon who gives him a magical book to read entitled ‘The Neverending Story’. As Bastian reads the story to himself we get to see the actions of the book’s heroes and villains play out in his imaginative brain. But as the story unfolds and intensifies Bastian gradually discovers he, himself, is part of the story and can affect the lives of the characters he’s reading about. Bastian reads about the troubles afoot in the fantastical world of Fantasia, the force of evil called ‘the Nothing’ is growing like a plague on the land. Its saviour comes in the form of warrior boy Atreyu who is sent off on a mythical, Lord of the Rings-like journey to save the world from the Nothing. If this summary sounds so very non-specific and fuzzy, so it is when watching the film. The film suffers most from its non-antagonist and imprecise needs and desires. Other than a black wolf which appears in two brief scenes the baddie in this story is a vague entity described as the ‘absence’ of good, that can only be described an entity as opposed to a person of flesh and blood. And so we’re never quite sure what the rules of this world are and what exactly Atreyu needs to do in order to save the world. But even in 'Lord of the Rings', the machinations of the ring journey was tenuous at best, and really just an underdeveloped maguffin, yet the search for a ring manages to sustain a couple thousand book pages, and 9 hours on film. In this case, Petersen substitutes narrative comprehensiveness with a strong cinematic epic quality. Conceptually the story within a story as dreamt up and realized by Petersen, is a magnificent fantasy world. Petersen uses the top notch effects of the day - physical make-up effects, scale miniatures, elaborate puppetry, matte photography, blue screen technology and optical effects – to create creatures and landscapes as magical as anything produced in the 80’s. While the effects are not completely seamless at all times (that flying dog looks a little wonky at times), the organic methodology is refreshing and can result in imagery just as realistic as today’s best CG. And under the Blu-Ray treatment, these visuals are stunning, and one of the best 80’s Blu-Ray upgrades I’ve seen. And then there’s the famous theme song written by the film’s composer Giorgio Moroder which book ends the film. Not having heard the song for 25-odd years, with today’s ears, its a wunderbar synth-pop anthem, and elevates the film – at least for us children of the 80’s – to high levels of nostalgia bliss. 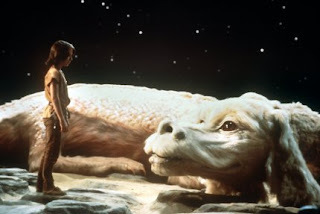 ‘The Neverending Story’ is available on Blu-Ray from Warner Home Video. really good director and really good acting. Nice job.